Troenes (Ligustrum spp. ): growing, planting, caring. A perfect shrub for hedges - but can reach up to 3 meters in height. Scientific name : Ligustrum spp. 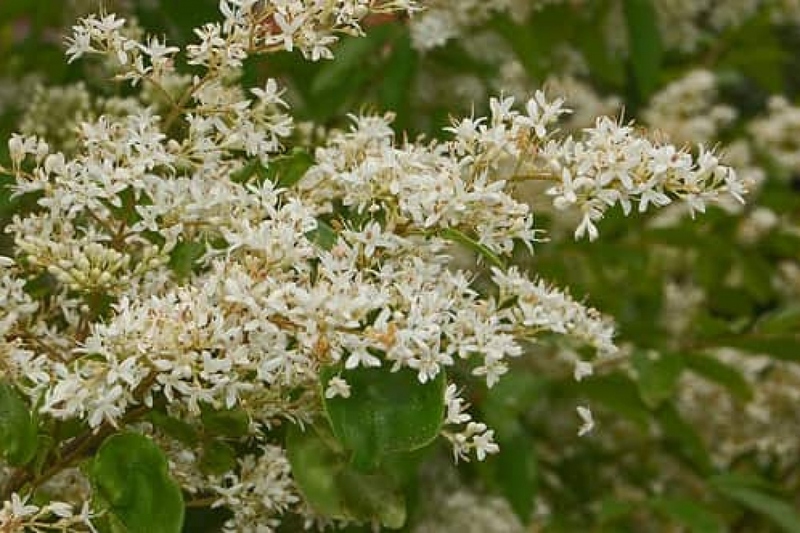 There are about fifty species of the genus Ligustrum which come from several continents. The European trotus, L. vulgare, is mostly used in hedges because it is vigorous. Ligustrum are all shrubs or deciduous trees, the largest reaching 20 m in their area of origin. The troenas bloom in summer, and form panicles of white flowers, provided they have not been trimmed too severely just before. Note that cultivars with variegated foliage are more dull in direct sunlight - Use them in a sheltered situation. Caution, the whole plant is toxic if swallowed. Plant privet trees from October to March outside the freezing period - planting before winter allows for better rooting - in the sun or partial shade. The privet gladly accepts any type of soil. In hedge, separate each one from 50 cm to 1 m, for a hedge planned to reach between 1 and 2 m high. Before planting, prune damaged roots and branches to balance root volume and aerial volume. Plant in a hole at least twice as big as the root ball. Basin the roots before planting, it will greatly improve the chances of recovery. Do not bury the base of the trunk while planting. Form a bowl around the foot that will be used for watering during the first months. Tamp the soil around the roots - do not hesitate to use all the weight of the body! Finally water until filling the planting bowl, at least two watering cans! In hedge, prune your shrubs in spring and in fall. Trim twice a year to never work on large twigs, and have a better result. The first years be patient, cut closer to the trunk than the final distance you expect; your privet must branch out regularly. Otherwise you will never get a dense result on the whole surface. If you already have a very old hedge of privets and you regularly see the death of some plants, there is a solution. The all hedge must be shortened by 20 cm in all directions, to allow the light to reach inside the foliage. For isolated shrubs, the principle is totally different! Only trim once a year, and remove the forks from the center branches to let the light in. If necessary, you can also shorten the outside branches with a pruner, not a hedge trimmer!